There is a range of different energy sources available to societies that vary in their sustainability, availability, cost and socio-political implications. The choice of energy sources is controversial and complex. Energy security is an important factor in making energy choices. What value systems can you identify at play in the causes and approaches to resolving the issues addressed this topic? How does your own value system compare with others you have encountered in the context of issues raised in this topic. How does the systems approach help our understanding of energy choices and security? Why do countries lack energy security? Why do some societies continue to use fossil fuels despite the damage they do to the environment? 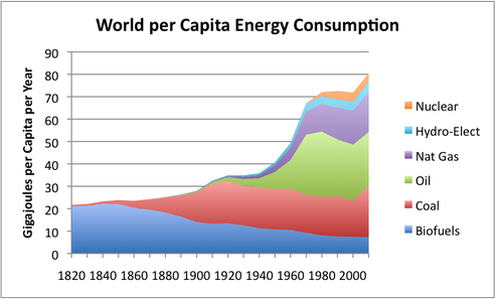 To what extent are global energy choices sustainable? How might energy choices evolve in the next decade? U 7.1.1 Fossil fuels contribute to the majority of humankind’s energy supply, and they vary widely in the impacts of their production and their emissions; their use is expected to increase to meet global energy demand. Fossil fuels are fuels formed by natural processes such as anaerobic decomposition of buried dead organisms, containing energy. Fossil fuels were formed from the dead and decaying remains of prehistoric living organisms millions of years ago. Intense heat and pressure inside the different layers of earth transformed these dead remains into modern day's fossil fuel reserves. The fossil fuels are energy rich carbon compounds and hydrocarbons such as coal, natural gas and petroleum. The technological advances in the 20th century made possible the extraction of fossil fuels from the earth commercially viable. All our modern transportation and industry development process have been made possible because of the discovery and extraction of fossil fuels. More than three quarters of the world's energy consumption comes from fossil fuels. 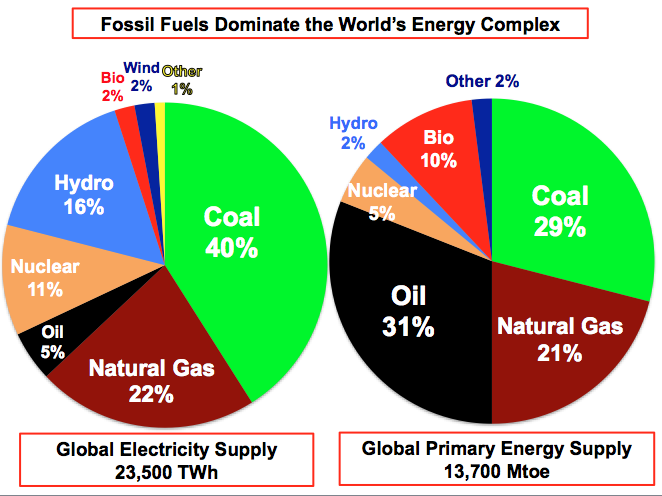 Of this approximately, 40% of fossil fuels are used in petroleum form, 15 % in natural gas form and 8 % in coal form. Fossil fuels are the main backbone of the industrialization but they have contributed to the burden of environmental pollution significantly. This has resulted in greenhouse gases, acid rain and global climate change. The massive demand for fossil fuels has resulted in depletion of their deposits at an alarming rate..
U 7.1.2 Sources of energy with lower carbon dioxide emissions than fossil fuels include renewable energy (solar, biomass, hydropower, wind, wave, tidal and geothermal) and their use is expected to increase. Nuclear power is a low carbon low-emission non-renewable resource but is controversial due to the radioactive waste it produces and the potential scale of any accident. Fossil fuels are nonrenewable, that is, they draw on finite resources that will eventually dwindle, becoming too expensive or too environmentally damaging to retrieve. 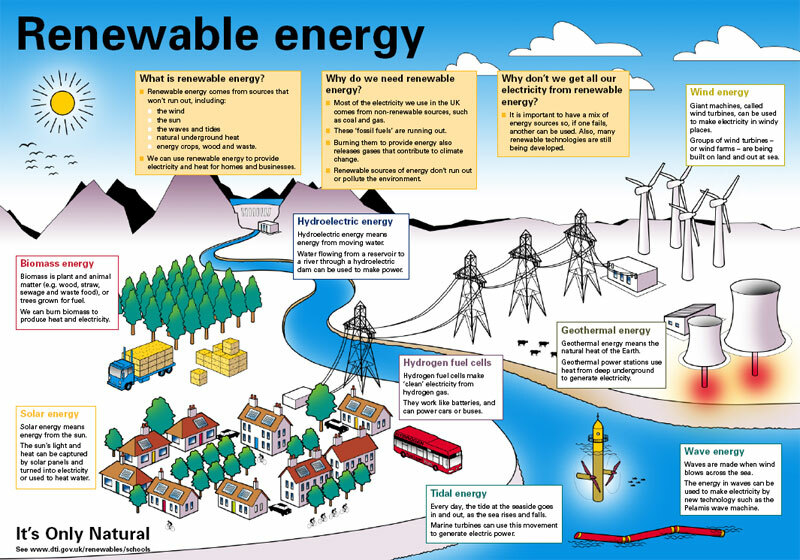 In contrast, the many types of renewable energy resources are constantly replenished and will never run out. Renewable energy resources are all sustainable as there is no depletion of natural capital. These resources can be large-scale for a whole country or small-scale for houses or communities. Nuclear power is also considered a renewable energy source. It emits no greenhouse gases, acidic gases, or particulates - linked to, respectively, global warming, environmental degradation. The energy output of nuclear fission is the highest of any option today. This reduces both the use of natural resources. However, nuclear power poses numerous threats to people and the environment and point to studies in the literature that question if it will ever be a sustainable energy source. These threats include health risks and environmental damage from uranium mining, processing and transport, the risk of nuclear weapons proliferation or sabotage, and the unsolved problem of radioactive nuclear waste. U 7.1.3 Energy security depends on adequate, reliable and affordable supply of energy that provides a degree of independence. An inequitable availability and uneven distributions of energy sources may lead to conflict. Energy security as the uninterrupted availability of energy sources at an affordable price. Energy security has many aspects: long-term energy security mainly deals with timely investments to supply energy in line with economic developments and environmental needs. On the other hand, short-term energy security focuses on the ability of the energy system to react promptly to sudden changes in the supply-demand balance. Access to cheap energy has become essential to the functioning of modern economies. However, the uneven distribution of energy supplies among countries has led to significant vulnerabilities. The Ukraine-Russia gas dispute in January 2009 caused the largest natural gas supply crisis in Europe’s history. With increasingly integrated electricity grids, blackouts can cascade and affect multiple economies simultaneously. U 7.1.4 The energy choices adopted by a society may be influenced by availability; sustainability; scientific and technological developments; cultural attitudes; and political, economic and environmental factors. These in turn affect energy security and independence. ​The choice of energy sources that a nation or society uses is very much dependent upon several factors. These include available energy resources, population size, historical energy use, needs of industry, available technology and political direction. Availability of the supply - domestic or international. Technology developments - does it already exist? Is there potential? Politics - can lead to conflict over supplies or choice to use domestic supplies at increased prices to reduce risk. Environmental Considerations - is it dangerous? U 7.1.5 Improvements in energy efficiencies and energy conservation can limit growth in energy demand and contribute to energy security. Energy efficiency has proved to be a cost-effective strategy for building economies without necessarily increasing energy consumption. Energy efficiency, is the goal to reduce the amount of energy required to provide products and services. Reducing energy use reduces energy costs and may result in a financial cost saving to consumers if the energy savings offset any additional costs of implementing an energy efficient technology. Reducing energy use is also seen as a solution to the problem of reducing greenhouse gas emissions. A 7.1.1 Evaluate the advantages and disadvantages of different energy sources. A 7.1.2 Discuss the factors that affect the choice of energy sources adopted by different societies. Resources within or near to a country are better than those further away. The choice of what energy source should be used is different to countries. Some have large oil, coal and gas reserves. That makes fossil fuels an obvious choice for an energy source. The generation of energy also depends on its availability, economy, cultural, environmental and technological factors. When an energy resource is available and close, it is easier and efficient to use. If an energy source is more expensive than others, it would reduce the likelihood of it been chosen. Globally, renewable energy sources are not used as much. These resources are still not ready to meet current demands. Renewable sources can be used more if the production prices of the non-renewable sources are increased. This may better the environment as higher costs of the fossil fuels means that peoples view will change. Peoples interest in renewable resources has led to an increased demand for renewable and non-pollution sources. This leads to a greater investment and research into more alternatives or improvements. Culture fears based on the fear of nuclear accidents and waste, have made it quite unpopular to choose. Cultural and tradition means that non-renewable resources are favored, and the places with renewable energy resources are limited. If an energy source is harmful to the environment, some societies might not choose it. 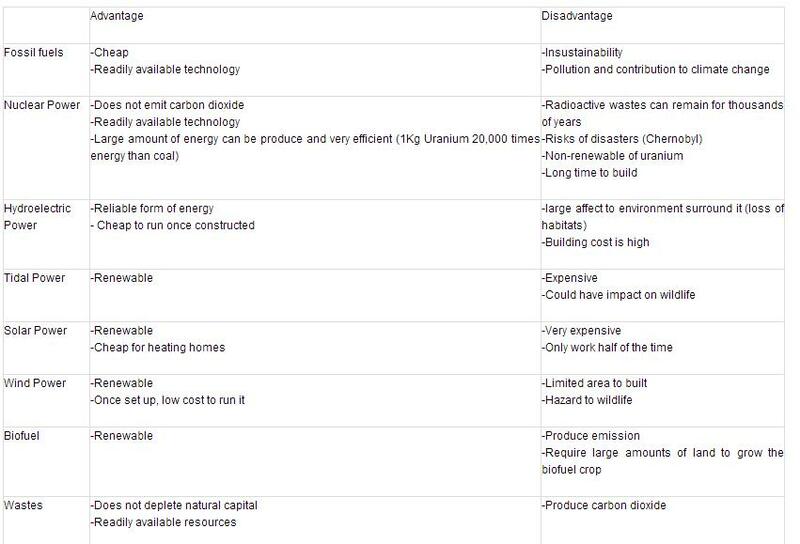 e.g Chernobyl disaster would cause USSR unlikely to choose nuclear energy. A 7.1.3 Discuss the factors which affect energy security. The energy security of a country can be measured using the ‘Energy Security Index’ (ESI). A 7.1.4 Evaluate the energy strategy of a given society. 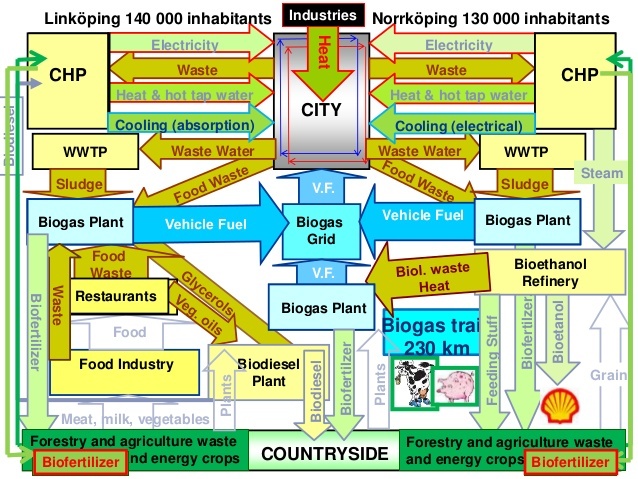 Energy use in Sweden is largely based on renewable energy. Thanks to cutting-edge technology and a wealth of natural assets, Sweden is in the front line as the world embarks on a shift to more sustainable energy systems. ​Few countries consume more energy per capita than Sweden, yet Swedish carbon emissions are low compared with those of other countries. According to the latest statistics from the International Energy Agency (IEA), the average Swede releases 4.25 tonnes of carbon dioxide (CO₂) per year into the atmosphere, compared with the EU average of 6.91 tonnes and the US average of 16.15 tonnes. Sweden has found a way to reduce emissions while the economy is growing. This interactive animation explains how photovoltaic panels convert sunshine to electricity. Choice of energy sources can have impacts at both local and global level as emissions of greenhouse gases can contribute to global climatic change. Political and economic situations around the world can affect energy security and choice of options. The choice of energy sources is controversial and complex—how can we distinguish between a scientific claim and a pseudoscience claim when making choices? Blind Spot is a documentary film that illustrates the current oil and energy crisis that our world is facing. Whatever measures of ignorance, greed, wishful thinking, we have put ourselves at a crossroads, which offer two paths with dire consequences. Bill Gates talks about the future of energy usage and his investments in alternatives to fossil fuels. For the Baltic States, the pursuit of energy independence is about more than reliable energy sources – it’s about political freedom. 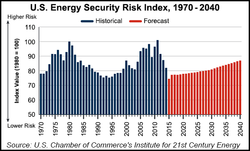 In today’s security context, many dimensions of energy security have become increasingly important.